While early services were being held in the Drill Hall in St George’s Road, in the summer of 1885, a plot of land was chosen: “ in Mansel Road, about 150 yards from the main road. It has a frontage of 70 feet and a depth of 239 feet and is about five minutes’ walk from the Station”. Architects, Potts Sulman and Henning, were engaged to draw up plans for a Hall. This was designed to “comfortably hold 200 people”. It was built by a Mr Nightingale who started work after Christmas 1885. The Hall was opened for worship on the first Sunday of May 1886 and this became the first “church” on the site. The total cost, including fees, was £1500. It was immediately realised that other rooms, a vestry, committee room and small kitchen, were essential and were added. By 1890 the congregation was outgrowing the Hall and in that year work began on the building of the Church itself. Originally designed to hold 550, the foundation stone was laid on 30th June 1890 by Samuel Smith MP. The walls of the Church were of natural yellow brick with red brick trimmings. There were no carpets or stained glass windows. Gas lamps hung from the roof beams and burners flickered in the transept windows. After much discussion is was decided to build a tower and spire but not to proceed with galleries over the transepts. The Church was dedicated on Friday 10th April 1891. The total cost of the buildings (including the organ – see below) was £8170. Many of the items of Communion plate still in use, a jug, four chalices and plates (inscribed “Trinity Presbyterian Church”) must date from the early days of the Church. It took the Church until 1902 to pay off the building debt, but having done so it was decided to purchase the freehold at a cost of £945, with the help of a mortgage. This was finally cleared in 1912. At the Drill Hall, Mansel Road (Old) Hall and for the first year after the Church was built a harmonium was used to accompany the hymn singing. In 1892 an organ was purchased from, and constructed by, Messrs Bishop and Son, an instrument that served the Church until 1964. At first an organ blower was employed and both he and the organist were positioned behind the pulpit. In 1928 mechanical blowing was installed by Bishops, the instrument overhauled and the console moved to the east transept (cost £761). By the early 1960s it was recognised that the organ should be replaced. Crouch Hill Presbyterian Church was closing and their organ was purchased for a nominal £500. This instrument had been built in 1927 by G H Foskett, later incorporated in Gray and Davison Ltd. The said Gray and Davison rebuilt the organ in Trinity at a cost of £2950 and it was dedicated in 1964. Considerable work was carried out on the organ in the 1980s. In 1997 a new console was purchased using a bequest from the late Harry and Betty Gorman. 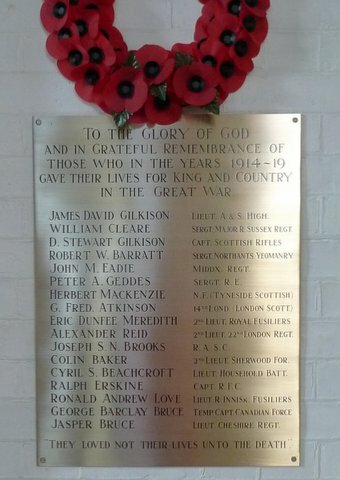 Following the Great War a memorial was erected in the north wall of the transept, bearing the names of seventeen men connected with the church who had died in the conflict. A further plaque was added showing six names after the Second World War. The memorial was later moved to the vestibule and, in 2013, after professional restoration, to the west wall. (See: trinityremembers.wordpress.com for further information about those commemorated on the memorial). Electricity was installed in 1924 at a cost of £140 plus fittings. A series of chandelier-type lights was installed in the nave. At the same time the church was thoroughly cleaned (£98). Services were held in the Hall for six weeks. The first kitchen (1886) was very small and always considered inadequate. In 1917, while the Hall was being used nightly to entertain soldiers from the camp on the Common, a new kitchen was built, thanks to the generosity of Mr Moody-Stuart. This was said to be twice the size of the old kitchen, “well ventilated and furnished with every needful appliance”. In 1980 that kitchen was demolished and replaced by a much larger, modern, prefabricated building. That kitchen was demolished and replaced at the time of the Redevelopment (see below). The north walls of the Hall had suffered subsidence in 1911 and 1921. This recurred in 1939. Following extensive underpinning of the Session room it was decided to build a new room (known as the “Upper room”) above it and to install a Gentlemen’s cloakroom. 1935: Mr G G Young gave to the Church a new baptismal font, a new Communion table (the carved oak sides carrying the old “top”), pulpit furnishings and carpets from the vestries to the Communion table. At the same time the stonework of the pulpit was cleaned. 1953: A Communion table lectern was given anonymously. c1954: A minister’s chair was given in memory of Sir Walter Kinnear. 1956: In memory of Revd. Douglas McRitchie a brass alms dish and offertory bags were given (in addition to the stained glass windows mentioned elsewhere). 1959: From the bequest of Mr G G Young the following items were received: Elders’ chairs, lectern, larger top for the Communion table, carpet down both aisles, garden with roses for the forecourt. c1965: After the organ was built a frame was constructed to fill the central panel behind the pulpit. A member gave blue/gold material which was fixed to the frame. 1967: From the bequest of Mrs A F Young a silver baptismal bowl. c1965: A wooden cross was constructed and erected above the organ by Mr Alan Rumsby. 1966: Two wooden outside seats were given in memory of Mr Donald Goss. 1984: At the time of the Centenary embroidered cushions were given for the chairs at the Communion table, together with two embroidered kneeling stools. A silver font flower bowl was given in memory of Mrs Margaret Jamieson, who died in 1978, and a garden was created on the forecourt with a memorial seat. 2000: Mrs Ruth Carlyle presented an embroidery of hands reaching upwards towards the cross that hangs above. The hands represented are male, female, child, white and black. All the stained glass windows in Trinity were designed and made by Messrs Goddard & Gibbs. In 1956 an appeal was launched in memory of Revd. Douglas McRitchie. £559 was received. Five stained glass windows were installed in the west wall of the Church. These represent St Francis, St Andrew, The Sower, Jesus with the children, and the Good Shepherd. In 1969 three windows in the west wall were given to the Church by Dr and Mrs Eric Sargent. These represent “Jesus in the carpenters shop “, “Jesus with Martha and Mary” and “Jesus healing the sick”. In 1989 Miss Betty Joss gave two windows in the west wall in memory of her parents. 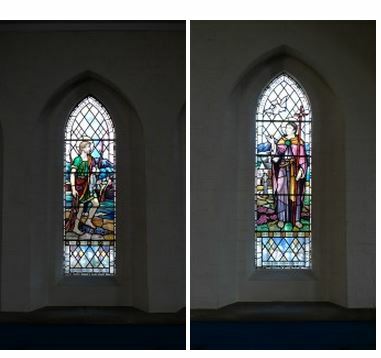 These represent “St Andrew, fisher of men” and “St Columba of Iona”. 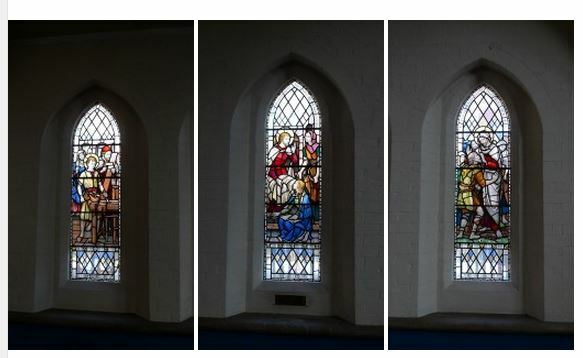 In 1997 three windows in the east wall were given in memory of Revd. H.Burns Jamieson. 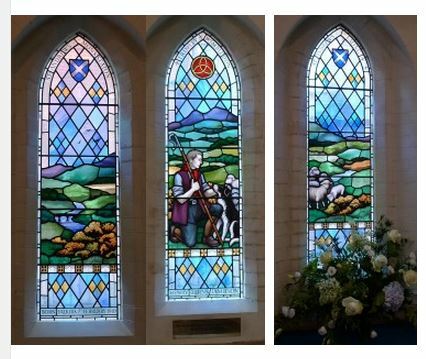 These depict a shepherd figure with a pastoral background, based on the border country. The first general amplification system (other than a series of hand held sets located at various places in the church) was given to the Church and installed in 1955. In 1986 a new system was given to the Church (£2800) by the van der Gaag family, in memory of Aad. This included an inductive loop system, new loudspeakers, microphones and cassette recording and playback systems. In 2009 part of the bequest of Miss Muriel Bremner was used to upgrade the system. A new digital processor was installed with control panel, together with new slim-line loudspeakers and radio microphones. The Church survived WW2 without serious damage, although a V1 fell on Wimbledon Hill in August 1944 and caused damage to the roof and windows on the east, High School side. Because of Government restrictions full repair could not be carried out until 1954. At that time extensive work was carried out on the buildings and new lighting installed. The chancel was widened and the Communion table moved forward over a foot on a new platform. The pulpit upholstery and chancel carpets were changed from red to “Presbyterian blue” and the walls painted white. When the Church was again redecorated in 1969, amidst great controversy, the north chancel walls and dados were painted blue. The chancel walls were changed back to white when next redecorated in 1986. In the late 1950s Trinity’s hall accommodation was limited to the main hall, Session room and Upper room. The growing Sunday School and Bible class (later YP group) were forced to use the kitchen, ladies cloakroom and nursery school a few doors away. It was therefore decided to build a prefabricated set of rooms (known as the “New Hall”) on the land behind the church. These consisted of one large and two small meeting rooms, hallway and cloakroom. This Hall was opened in November 1961. The main hall was thereafter known as the “Old Hall”. In May 1996 the choir and transept pews were removed and a new platform was built across the whole width of the chancel. The organ console and font were positioned on the platform which was carpeted. The new chancel area was dedicated in memory of Betty and Harry Gorman whose bequest made the alteration possible. Individual chairs were purchased for the new chancel, the cost being donated by members in memory of family members or friends. Considerable work has been carried out on the stonework, most recently in 1987 and 2002. By the mid 1990s much of the hall accommodation was in need of major renewal or renovation. The New Hall in particular had reached the end of its life. The decision was taken to build a suite of halls and rooms behind the church. An original decision to demolish the Old Hall was rescinded, following approaches from the Victorian Society which led to the church being Grade 2* listed. The old Session room, upstairs rooms, stairway, kitchen and New Hall were demolished. The Old Hall was modernised and decorated and six meeting rooms were constructed plus a kitchen, office and cloakroom accommodation. A lift was installed and a disabled lift was installed from the Church new premises. The total cost of, what was named the “Mansel Road Centre” (MRC) was approx. £1.75m. In 2009 (??) the vestibule cloakroom was renovated, to be convenient for the disabled. Thanks to a bequest from Miss Muriel Bremner a completely new lighting system was installed in the nave in 2009.